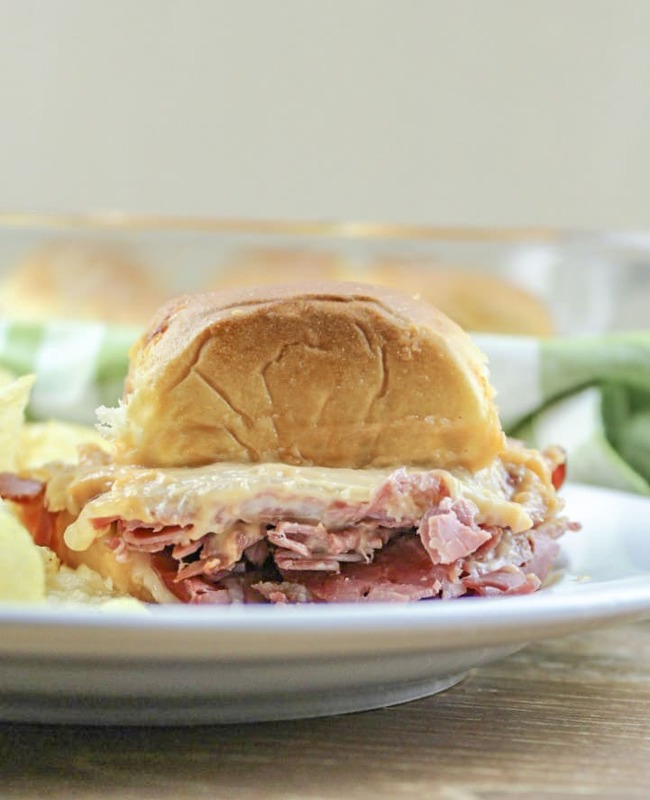 These easy to make Corn Beef Sliders with Horseradish Sauce are savory and packed with great flavors. 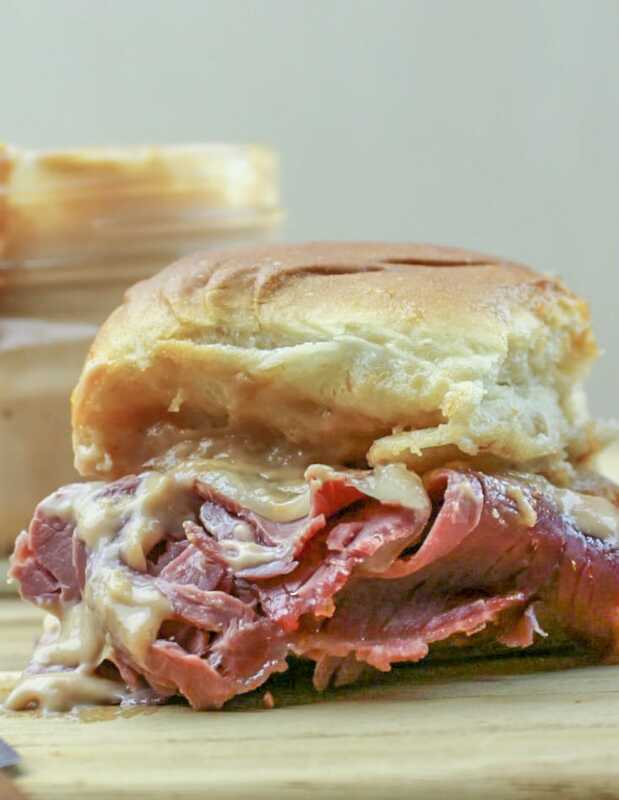 The creamy horseradish sauce give these sliders a subtle kick that’s the perfect compliment to the corned beef. Saturday is a lazy day at my house. We tend to hang out in our sweats and just relax. For lunch we usually just have leftovers or I make sandwiches. My husband really likes Rubens. I don’t really like the sauerkraut though. So I decided to make a spicy sauce to go with the corn beef instead so we would both be happy. I have to say I’m really pleased with how well this sauce compliments the beef. I used sweet rolls as the buns for my sliders. The sweet combined with the spiciness of the horseradish was really quite good. 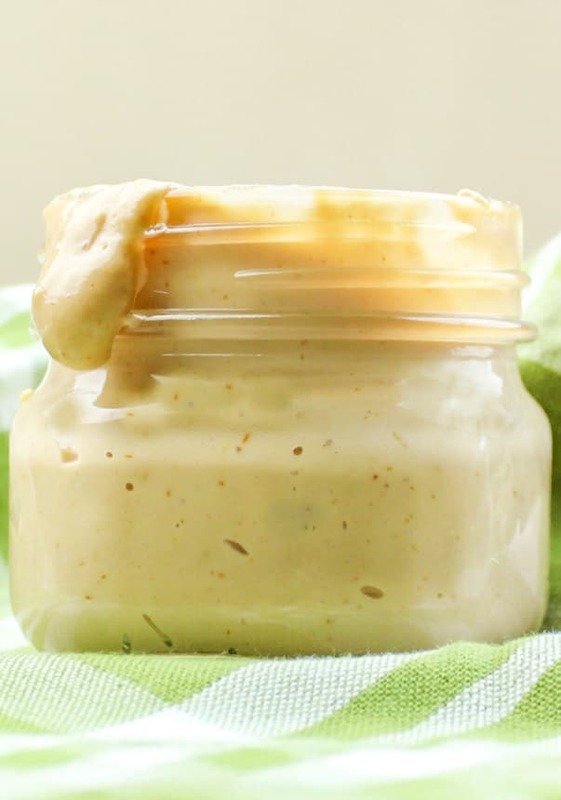 To make the sauce you simply mix together mayonnaise, ketchup, Dijon mustard and creamy horseradish in a medium bowl. Stir well making sure all the ingredients are well combined. After you make the sauce you will need to slice your buns or rolls in half horizontally to make two large pieces; a top side and a bottom side. Place the pieces on a sheet pan and spread the sauce across each side. Next layer the corn beef across the bottom half of your rolls or buns. Then layer the Swiss cheese over the corn beef. I actually doubled the cheese but a single layer will do just fine. After the beef and cheese are layered on flip the other half of the rolls or buns on top. Then spread a light layer of butter on top. Cover the sliders with foil and bake at 350º for fifteen minutes. Once you’ve removed the sliders from the oven use a big knife to cut them apart. Serve with a salad, fries, chips, or soup. Thanks so much for reading! I hope you’ll come back soon and check out another great recipe! 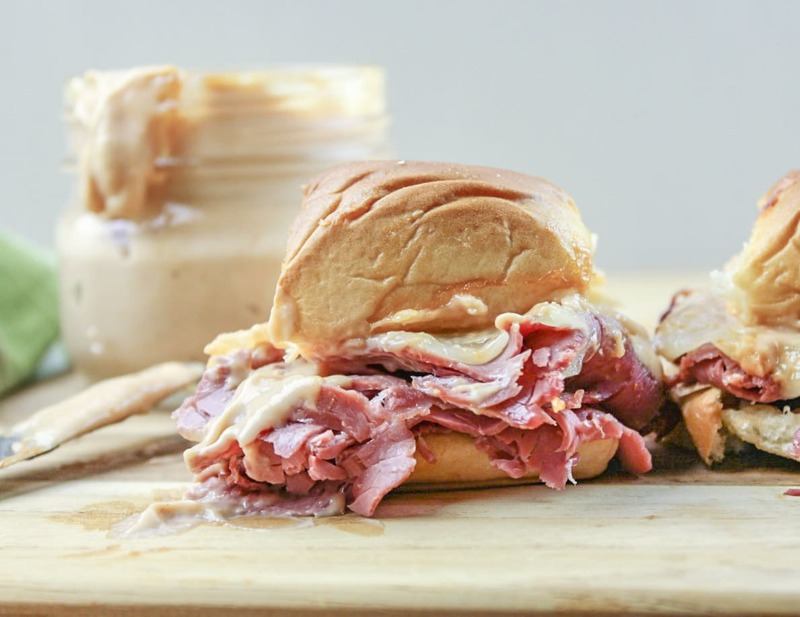 These easy to make Corn Beef Sliders with Horseradish Sauce are savory and packed with great flavors. 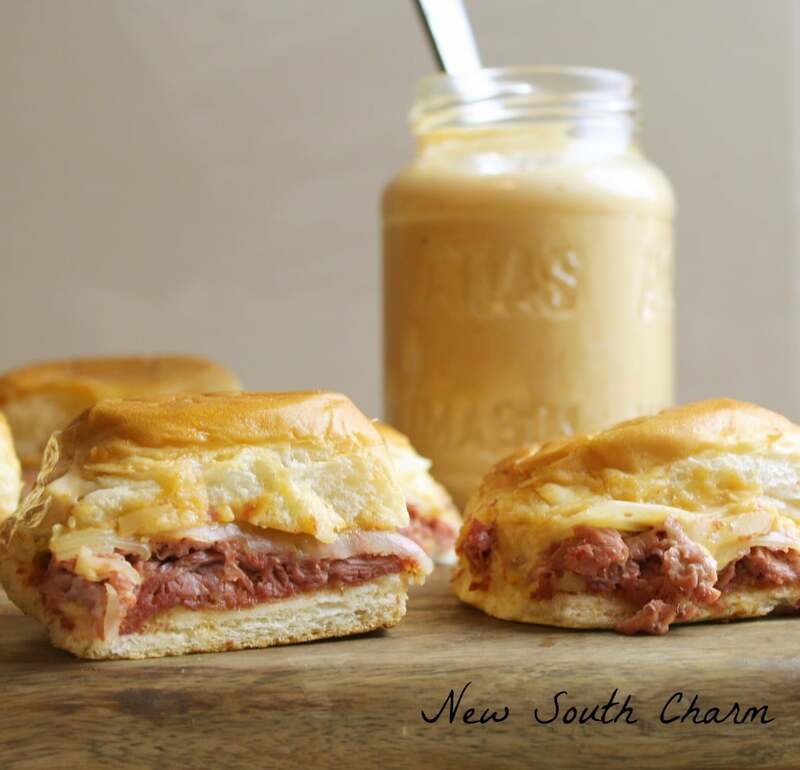 The creamy horseradish sauce give these sliders a subtle kick that's the perfect compliment to the corned beef. in two separate pieces. Place on a sheet pan. Spread the sauce on both sides of the bread. Cheese. Complete the sliders by putting the “tops” back into place. Spread top of rolls with a thin layer of butter. Cover with foil and place in preheated oven for fifteen minutes. Are you looking for more recipes and fun for St. Patrick’s Day? You’ll love these ideas! I love corned beef! YUM!! Thanks for sharing! These look wonderful and know taste wonderful too! Please join us at Thoughts Of Home Thursday, we would love to have you. These sliders look so good. I always forget about corned beef, except for St. Patrick’s day. Thanks for opening my eyes to more possibilities. Thanks for sharing at DI&DI. These sliders sound so great! I can’t wait to try them. I just came for the sauce.. hahah. I love thick sandwiches.. a mouthful with each bite!! Horseradish, one of my favorite spicy toppings! Love this recipe, so glad you shared it with me. These sound delicious. My husband loves Reubens too (and I don’t like sauerkraut either). Horseradish is a great compromise we both love it. I bet my Rye Yeast Rolls (recipe on my blog) would be great with these. Pinning. These look absolutely delicious!! Omg talk about craving city!! I really should get myself some corned beef so I can make all this nummy Irish stuff! Thank you for sharing with us at Throwback Thursday, we hope to see you again this week! I think these might be my favorite kind now! This sounds lovely! Thanks so much for sharing with us on Throwback Thursday! Hope to see you next time! Oh my goodness, how good does that look?! I have some horseradish sauce in the fridge and am sure to have some extra corned beef in a couple of days. This is going to happen! Thanks for bringing your amazing sliders to Throwback Thursday! This will be featured at tonight’s party! Can’t wait to see you there! Can you believe I have never had corn beef and cabbage! I think it is time. Looks so good. That sauce sounds amazing. I think these would be a big hit in our house. This is my kind of sandwich…all of my favorites!!! Those lazy days are my favorite kind of days and these sandwiches look like they take it to the next level! I want one now! An oldie but a goodie! Love horseradish! The links are almost like the colors of the Irish flag. Love it! I have always wanted to try baked sliders! This sounds delicious! These sliders look so, so good! 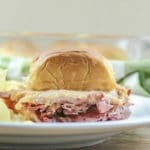 We make ham and cheese sliders and chicken parmesan sliders, but now I can’t wait to try these corned beef sliders with some of our leftover corned beef this year. My husband is going to totally love these! I’ve never had corned beef before, but can’t wait to try it! I love that you made this classic sandwich into a slider! My kids were skeptical, but once they tried these little guys, they couldn’t get enough! My husband loved them too. I was glad I made 2 batches because guests were taking 1 to try, then came back for 2 or 3 more! If that’s not success, I don’t know what is. At my husband’s request, I served sauerkraut on the side for folks to add to their sandwiches if they wished. I did not get to try the sauce, because I discovered last minute that my horseradish had gone south. So in place of the sauce, I just used horseradish mustard and this worked out very well. This was served at our 2019 St. Patrick’s Day party.